Falling gas prices over the last year have decimated UK coal plant generation margins, causing a substantial threat to security of supply. Falling gas prices over the last year have decimated UK coal plant generation margins. In the UK, coal plants are hostage to CCGTs when it comes to setting wholesale power prices. CCGTs dominate the supply stack which means that falling gas prices flow through into falling wholesale power prices. This has acted to erode generation margins to the point that entire UK coal plant fleet is unprofitable at current forward market prices. These conditions have substantial security of supply implications for the UK power market. They also open a window for the UK government to follow through on its policy intention to remove coal from the capacity mix. But it is unclear how the UK market will maintain an adequate level of system capacity through this transition. Coal plant generation margins, commonly referred to as clean dark spread (CDS), are driven by the premium of power prices over plant variable operating costs. Variable costs are predominantly driven by coal and carbon prices. The decline in UK gas hub prices over the last year has dragged down UK power prices (set by CCGT plants). 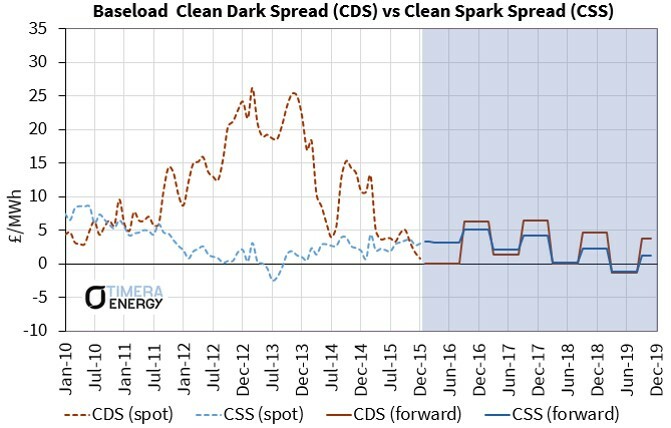 Gas plant generation margins, known as clean spark spreads (CSS), have remained relatively steady as power prices have fallen. But falling power prices have crushed CDS. Chart 1 shows the historical evolution of spot UK CDS and CSS as well as current forward curves. UK CDS for a 36% efficient coal plant is currently hovering around zero. The market convention for measuring CDS shown in the chart does not however include plant variable transmission costs, coal transport costs and start costs. When these are factored in the variable margin on older coal stations is significantly negative. CDS weakness is driving an increase in CCGT load factors as they displace less efficient coal plants from the merit order. In addition CSS are showing signs of a recovery as 2016 progresses. This is providing some much needed relief for UK CCGT owners. Higher spreads and load factors and lower start costs are providing a significant margin boost. CDS drives the real time operational decisions of coal plant owners. But owners require more than a positive CDS to keep their plants open. Annual fixed costs for coal plants can be upwards of 50 £/kW (double that of CCGTs). Chart 1 shows the anaemic forward CDS levels at which plant owners can currently hedge generation margins. CDS below 5 £/MWh cover only a fraction of coal plant fixed costs. In other words owners that keep their plants open are doing so on the basis of praying for a recovery in CDS. A pronounced oversupply in the global gas market suggests it may be a long time until those prayers are answered. SSE’s patience ran out last week as it announced its intention to close 3 of 4 units of its 1.9 GW Fiddlers Ferry plant. Despite having a Capacity Market agreement to remain open in 2018/19, it makes more sense for SSE to close Fiddlers Ferry and incur the associated penalty (~£30m) rather than suffer ongoing losses against plant fixed costs. This brings the volume of UK coal plants on death row to 6.5 GW, with Fiddlers Ferry joining, Longannett, Eggborough and Ferrybridge. The market is starting to price in the system capacity risk associated with these closures. Forward spark spreads jumped significantly last week in response to SSE’s announcement. More concerning is the fact that there are another 7.5 GW of UK coal plants on the endangered list, also currently suffering significant losses versus fixed costs. These include Rugeley, West Burton, Cottam and Aberthaw. At least 2 GW of this capacity could be classified ‘highly endangered’ given lower efficiency and lack of capacity agreements. As we set out in our first article this year, the UK’s official capacity market has failed to incentivise development of any large scale new capacity. It has in fact resulted in the closure announcements of a large volume of older CCGT and coal capacity given capacity auction price levels below plant fixed costs. As a result the UK has fallen back on a proxy capacity payment mechanism, the Supplemental Balancing Reserve (SBR), in order to maintain an adequate system reserve margin. SBR is an unruly and highly unpopular intervention. Most controversially it has involved payments to keep coal plants open at levels well above the clearing price of the official capacity market. This is not only concerning from an emissions perspective but has a highly distortionary impact on plant economics. High SBR payments create an incentive for remaining coal plant owners to follow suit, announce closure and try the SBR route. In other words SBR, like the official capacity market, is encouraging plant closures. This is a pretty obtuse policy achievement for a government worried about security of supply. There have been two missed opportunities to address the UK’s security of supply issues via the official capacity auction route. It is considerably cheaper to keep older gas plant on the system than to subsidise new build. We also suspect that a moderately higher capacity price and some minor reforms (e.g. around transmission costs) could flush out a cost effective range of new capacity e.g. small scale gas peakers, larger scale OCGT and even coal plant conversions to gas. Rather than a moderate response, we suspect SSE’s Fiddlers Ferry closure announcement (and the threat of more to come) will cause the government to hit the panic button. That is likely to mean direct support for large scale new build gas plant. Renewable and nuclear plants have claimed their hand-outs. CCGTs are likely to be next.